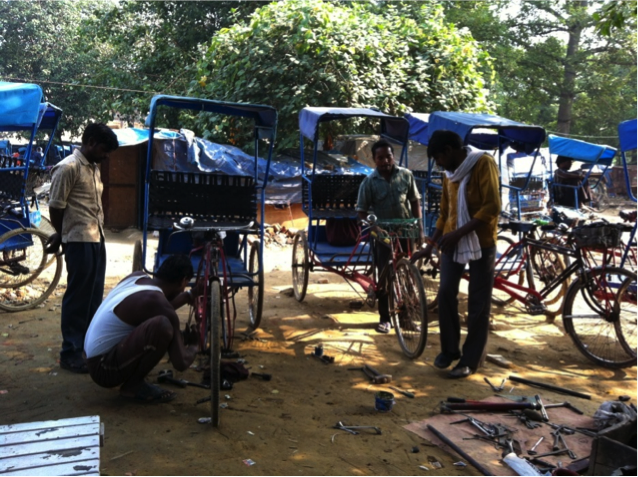 IMTFI fellow Deepti Kc reports on IMTFI-sponsored research among rickshaw pullers in Delhi, India undertaken with Mani Nandhi. Mobile banking is now a reality in a number of developing countries. Rather than the traditional branches, mobile money services in India use non-bank agents (also known as business correspondents) to facilitate financial transactions on behalf of banks. In cities like Delhi, India, where millions of poor migrants come from rural areas, such mobile banking services with nominal Know Your Customer (KYC) norms present an immense opportunity for reducing barriers to financial inclusion. Yet, the uptake among the poor of mobile banking services, especially of savings products, has not been encouraging. A number of mobile money professionals are increasingly looking into specific behavioral patterns that may illuminate why, despite the availability of low-cost and higher-security financial services, many of the poor continue to rely on expensive and high-risk methods of saving and credit (see, for instance, Mas 2012). 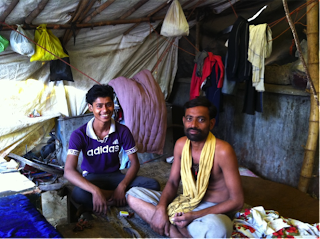 Reflecting similar questions, in this post I highlight some preliminary observations on psychological barriers to mobile banking among rural migrant rickshaw pullers in Delhi. These observations have emerged through the course of the research project that Mani Nandhi and I are currently conducting in Delhi, India, with funding from IMTFI. Rickshaw pullers fixing their bikes before starting their day in Delhi, India. While the main barrier to financial inclusion of India’s rural migrants is unawareness of mobile banking and persistent culture of distrust of financial institutions, we found that, often other forms of psychological hurdles also act as barriers. For our research, we visited an illegal slum settlement inhabited by migrant pullers. Most of these pullers are involved in agricultural activities in their native villages and visit Delhi during off-season with a sole focus to maximize earnings during the migratory period. Our study focused mainly on the mobilisation of those pullers with no identification cards so we could help them obtain government Unique Identification cards and link them to mobile services. As a first step of our study, we asked some pullers who already had an identification card and a mobile phone to use a mobile bank account to save. This was done to examine whether an initiative to promote savings using mobile banks can help these pullers to switch from informal to formal savings mechanisms. At the time of our meeting, all of these migrants were saving on a daily basis with their “tekedhar” (the rickshaw owner). This case study highlights psychological barriers that hindered the savings capacity with mobile banks of four migrant pullers. Ready to work after a morning meal of rice. "I am not a valuable customer." Since he first reached Delhi five years ago, Man Singh has tried multiple times to open a bank account. Even though he manages to save and remit money to his village through informal mechanisms (such as sending money with their friends and other fellow rickshaw pullers or the Hawala network), there are times when he cannot provide money when his family members urgently need it. He was earlier misled by an NGO staff member, who charged him to fill out the application form to open a bank account. To this day he has not been successful in opening an account, making him extremely cynical about mainstream financial institutions. At this point, he strongly believes that he is not a valuable customer and does not want to save with a bank where he is not valued. Despite our encouragement and information about mobile banking, he refused to come with us and open a mobile bank account. "It is expensive to save with mobile banks." Raja opened a mobile bank account because his friend opened one, yet, he does not see any benefits in saving with mobile money services when there is a cost for every transaction when saving is free with his tekedhar. Like Raja, most poor people are highly loss-averse, and this tendency can create reluctance to save with mobile banking. While mobile banking can provide a safer mechanism to save, one should also understand that informal saving mechanisms have their own inherent advantages, which appeal to the poor when conducting savings transactions. "The mobile counter is not at a convenient location." 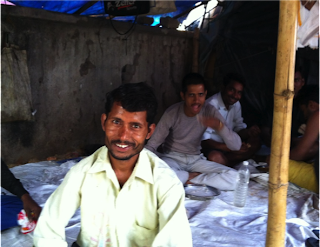 An enthusiastic rickshaw puller Bharat approached us to help him open a mobile bank account. He believes that he spends more when his money is easily accessible to him and believes if he keeps his money in the bank, he will be able to save more, as this will help him not spend on temptation goods such as alcohol and gambling. However, even though the mobile bank counter is around 2 km away from his place, for him the location of the counter is the problem, as he generally does not visit that area. Thus the location of the counter appeared as a potentially “real” cost for Bharat despite knowing the advantages of opening a bank account. This highlights that a sheer hassle such as the location of a service provider can rationally underlie the decision to be unbanked. "I will open my bank account tomorrow instead of today." Ram intends to visit a nearby mobile bank counter whenever we ask him. He does not think the mobile counter is far away or at a inconvenient location. In addition, he sees value in opening a bank account. However, no matter how much we insist, the day of the proposed visit, he is conflicted as he prefers to go to work and declines to come with us on that day, promising that he will visit the following day. As a matter of fact, this was the most common problem that we faced while getting these rickshaw pullers their bank accounts. The pullers who had earlier shown interest to open bank accounts simply refused to visit the nearby mobile counter. Rickshaw pullers in their road-side tents. These stories speak to common psychological barriers that the poor face when accessing formal savings institutions. Therefore, encouragement is needed to overcome these psychological barriers to saving through MM services. First, mobile bank agents should understand that when a client enters a counter, he/she may lack the necessary knowledge about the benefits of mobile money and, at the same time, he/she may be reluctant to join the new service based on a feeling that he/she could never be a valued customer. When such client enters the counter, it is important that agents guide them well, and explain the product properly. If agents do not value such customers and treat them with an abrasive attitude, this will further dissuade the unbanked from pursuing the mobile banking option. Second, psychological barriers occur due to potential clients’ failure to see the value of the product or service. Thus, products must be designed to address the psychological constraints faced by the poor when accessing formal savings products. To increase uptake, products must have add-on features such as basic financial literacy about the products. More generally, as Jake Kendall recently suggested, mobile money service design must seek to simplify financial accounting interfaces in order to be accessible to a broader public. Mobile banking agents can play a role in raising awareness among the poor about disciplined saving practices and about the added security of mobile banking, which can provide better protection from from risk of theft and from temptation to spend money. In addition, agents should inform their clients about the interest that one can earn from formal savings—something that is not always possible in informal saving practices. Mobile banks can facilitate greater awareness campaigns in partnership with trusted local governance institutions regarding savings with formal institution, which can play a vital role in overcoming these psychological constraints that the poor face. Third, while saving with mobile banks is safer, the poor still turn to informal savings mechanisms because of their flexibility and accessibility. Formal savings products must therefore be designed and marketed in a way that accommodates savings preferences of the poor. Product enrollment procedures should be simpler, transparent and convenient. Finally, there might be value in encouraging mobile banks in India not just as a means to remit but also as a means to save. In the following post, guest bloggers and researchers from the Grameen Foundation offer best practices for microfinance institutions operating mobile financial services programs. Be prepared. As a general rule, business models are not easily transferable, because no two markets are identical. Therefore, before launching any services, MFIs should carry out all the necessary research, including a cost/benefit analysis, client-focused market research, assessments of internal structure, processes and IT capacities, business models and market environments. Communicate. It is just as important for an MFI to proactively communicate to their staff about strategy as it is for it to externally brand the new product and/or service. Without buy-in from the staff, especially loan officers, the chances of success are significantly reduced. Establish a change-leadership plan. Implementing mobile financial services can have a significant effect on an organization’s internal structure and processes. Therefore, it is important to ensure that the new applications are fully understood by your staff as well as your clients. Staff may need to acquire and develop new skill sets. Seek partnerships. Although it is possible for an MFI to develop mobile financial services from scratch, given the state of the MFS market today, it usually is easier and cheaper to seek partnership with a mobile network operator (MNO), a bank or third party. Test and monitor services. Because the MFS market is still relatively new, it is constantly changing, with new technologies and developments occurring every day. An MFI must regularly test and monitor its market environment and be prepared to make necessary changes to re-adjust their strategy. Timing is key. An MFI should take its time in developing its MFS strategy in line with the market environment. However, once the decision is made and the business case exists, it should act decisively, to ensure that it doesn’t miss out on market opportunities as new, non-traditional entrants compete in the space. Innovation is needed around products. As more MFIs offer repayment and disbursement services, and MFS becomes more commonplace, there is a need to be more creative about the use of the mobile phone for new product innovation to remain competitive. This could involve bundling products, creating tools to increase savings, combining data sources for alternative credit scoring, or partnering with other channels, to name a few options. Take a customer-centric approach. Mobile phones offer a unique opportunity to provide a tailored touch for clients and improve customer service. Listening to customers can lead to keen insights on potential products or services. In addition, keep in mind that once adoption of mobile financial services takes place, customers begin to have higher expectations about services. Develop an integrated system. An MFS that is integrated to an MFI’s management information system is crucial to the success of its implementation. Manual reconciliation should be avoided at all costs. Develop or leverage an extensive agent footprint. Without a channel and well-designed distribution network, an MFS will only have a limited reach. Collaborate with regulators. In addition to analyzing the regulatory environment, it is important to build relationships with regulators and provide them with insights about the market. Remember – mobile financial payments are still relatively new for most players, supervisory authorities included. To learn more about Grameen Foundation’s Best Practices in Mobile Microfinance study and download the complete document, please visit http://www.grameenfoundation.org/resource/best-practices-mobile-microfinance. This study was supported by IMTFI. Disclaimer: Any opinions, findings, and conclusions or recommendations expressed in this material are those of the author and do not necessarily reflect the views of IMTFI. 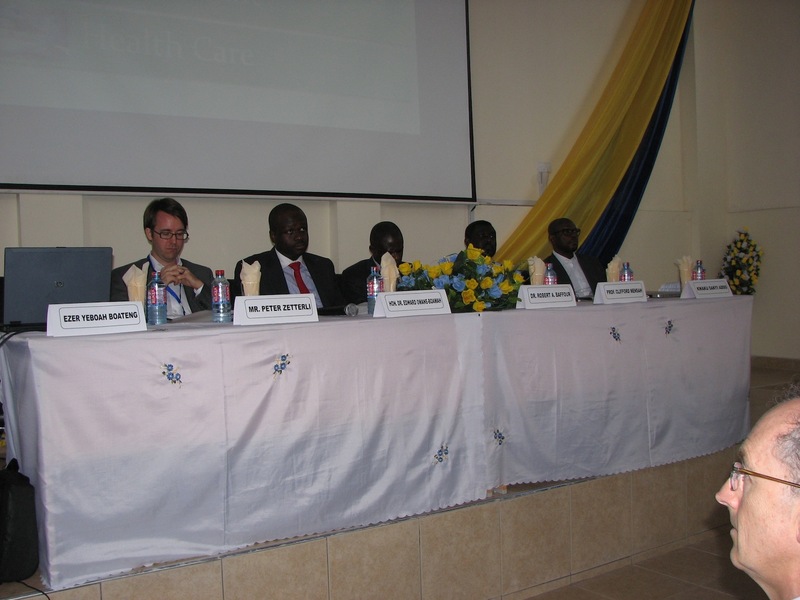 IMTFI fellows Cliff Mensah and Richard Zhixin Kang report from Accra, Ghana on the conference "Reaching the Unreached: Mobile Money Uptake in Ghana." See the program here. What is IT? she asked. Is IT here ... in Ghana? How does IT work? This is an excerpt from a dialogue we had with a respondent while collecting data in the streets of Accra, the capital of Ghana; unfortunately, it reflects the views of many Ghanaians who could benefit from the use of mobile money (MM). Without apportioning blame, we ask: How can “IT” be used, if “IT” is not known? The case of mobile money uptake in Ghana, thus far, has been anything but successful. One wonders whether this is due to the regulatory environment, the lack of trust in the service providers, a simple lack of knowledge, or the spate of fraudulent online activities plaguing the nation. To address the low uptake of mobile money, a diverse body of researchers, practitioners, retailers and consumers of telecommunication products is convening to discuss the issue at a 2-day conference on MM uptake titled, “Reaching the Unbanked,” and scheduled to take place at the Ghana Technology University at Tesano, Accra-Ghana on March 12th-13th. The conference is bringing together all the relevant stakeholders in the mobile money industry in Ghana to deliberate on the slow adoption of mobile money and strategies to improve its uptake.